Find Me/Follow Me - We've all seen the commercials touting the responsiveness and availability of your insurance agent in times of need. Insurance agencies can utilize their VoIP platform to facilitate this promise in becoming a reality! Calls into the agency can be routed to the agent, adjuster, or other customer facing staff via a direct transfer or by implementing a find me / follow me feature on that associate's extension. Most utilize their cell phone as the destination for such routing of calls. Strategic Use of an Auto Attendant - Whether it be as back up during hours during high call volume or as the primary after hours process, agencies have utilized an auto attendant to help route customer calls to a destination that meets their current need. The agency may have a claims center or roadside assistance center that supports them, and customers can choose the particular option that meets their need and be transferred there. Reaching the agent or other staff after hours or in an emergency can be additional options on the attendant. Time of Day Routing and Holiday Schedule - A great feature of hosted VoIP is that it is essentially a program, one in which insurance agencies and similar businesses can customize to their schedule. During normal hours, they may choose to ring the office phones in a certain pattern. After hours, they can streamline the ring pattern and fall to an afterhours auto attendant. Similarly, holidays can be scheduled to operate in after hours mode and the greetings can be customized to the holiday. 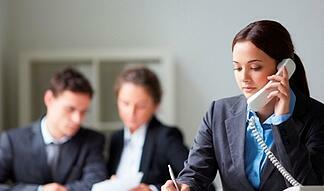 Voicemail to Email - Obviously, there are times where agents or adjusters are simply unable to take a call. With voicemails being delivered to email, they are able to immediately be notified of a customer's need, listen to the voicemail, and respond according to the level of urgency. Insurance companies that deploy hosted VoIP to their headquarters and agent offices can achieve even greater benefit. First, the economics of using a hosted provider across so many locations is very compelling. Many hosted VoIP providers offer a declining rate schedule based upon volume. Especially in the agent office settings, the savings over their current phone service can be significant. Additionally, companies can drive uniformity to their agent offices, whether they are company owned or franchised. Certainly, a common phone system drives uniformity in and of itself. More importantly, standard messaging and processes can drive positive customer recognition and loyalty. Similar auto attendants and messages, call flows, hours of operation, and such can all be managed centrally in a hosted VoIP deployment. These benefits are very applicable to the insurance agency, but they apply to many businesses, professional service firms, and other organizations as well. It has never been a better time than now to check out the advantages offered by hosted VoIP companies and improve service to your customers! 1. Low Capital Investment: The cost of a full-featured phone system can be a very expensive solution. Many sacrifice functionality to lower the cost of entry. Alternatively, a Hosted Phone solution requires just an investment of phones and some ancillary data equipment, a vastly smaller up-front investment, while providing the same feature set that Digital/VoIP systems offer today. 2. Mobility: The strongest value an insurance agent can provide is to be accessible to his or her clients, as they must be available after the sale in case their customers need to file a claim; fires and floods don’t just happen between 8 and 5. Hosted Phone service permits them to be available 24 hours a day, in any location. Hosted VoIP applications can be programmed to route work calls to cellular phones or route calls to an answering service. Additionally, agents can have a duplicate business phone at their home or take it on the road, and it will work exactly as if they were in the office. With these mobility options, agents can be fully responsive to their customers even when they aren’t in their physical office. 3. No Busy Signals! Insurance agents never want their existing clients (or prospective clients) to hear a busy signal. Existing clients typically call only if they are in a time of need. Certainly, prospective clients hearing a busy signal may just try to call the agency down the street. The majority of Hosted Phone solutions don’t have a limit on the number of inbound calls that a customer can take, meaning that your customers will never hear a busy signal, making your insurance agency more accessible to customers. 4. Accessibility: There will always be situations when an agent can’t take a phone call, whether due to meetings or being on the other line with another client. To that end, Hosted Phone Services provide two benefits: A) they provide a “repository” for information such as fax messages and voicemails, and B) they allow agents to access those from almost any location. With a Hosted System, agents can call from any outside phone to check their voicemail messages. Hosted Systems also can send digital copies of voicemail and fax messages to an agent’s email inbox, allowing the agent to check messages from a “smartphone” or from a home computer. This gives the agent flexibility to not only obtain messages from any location, but also store them on any device (work desktop computer, laptop, etc) that is most convenient for the agent. 5. Quick, free long-distance calling: I hear many of my insurance agent clients say that they frequently have to call underwriters, almost all of whom are in a different state. With many Hosted VoIP solutions, the numbers of various underwriter contacts can be programmed into the phone, meaning that agents don’t have to paste these numbers up all around the office and don’t have to waste time dialing the full number out. Also, if an agent doesn’t have a digital phone solution already, each one of these calls can be very costly if they are long-distance calls. Most Digital Hosted Phone solutions include free long-distance calling, meaning that the bill will always be affordable and predictable. While a Hosted Phone solution might not make sense for all insurance professionals, there are a great number of benefits that make such a solution worth exploring. As with all significant decisions, do your homework. Make certain that the VoIP provider is reliable, and don’t be afraid to ask for references specific to your industry. Also, inquire about a list of features specific to how your firm conducts business. Finally, confirm that there aren’t any hidden fees or contracts that increase over time; you want to ensure that your phone service provider is always earning your business. Thanks for reading, and have a wonderful day! Please comment. About the author: Brandon Smith is a Digital Phone Solution Specialist with sipVine, a provider of a variety of digital phone solutions. Brandon has worked with numerous insurance agents and other professional service clients to formulate the right solution for their business.